You'll get to dress up as Father Christmas, obviously. "The 'Holiday Hoarders' mission," the official site reveals, "gives a festive feeling to the existing Paris location with snow, decorations and even presents, which have been scattered all around the palace. Unfortunately, not everyone in attendance at the fashion show is there to spread festive joy. Two thieves have gained entrance to the fashion show event and are stealing the presents. As Agent 47, it's your job to stop them, for good. If you are able to get to the presents first, feel free to open them and use whatever you find inside to help eliminate these two sticky bandits..."
IO/Square Enix say they're releasing the mission in support of the World Cancer Research Fund; they're asking players for a voluntary donation to the charity. However, the Holiday Hoarders mission isn't all that's coming to Hitman this festive period: there's going to be a new thing every week until the end of the year. 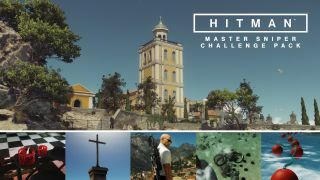 Thing The First, arriving this week, is the Master Sniper Challenge Pack, which adds five new Sapienza challenges. Meanwhile, next week brings the aforementioned festive assassination mission, along with a game update and a new elusive target. Week 3 brings an escalation contract in Sapienza, on the other hand, and there'll be a new Bangkok elusive target at around Christmas time. Have a read of this post on the Hitman site for a bit more info.